We do our utmost to provide the best possible service to all our customers. That includes assisting with collections or drop-offs at the airport, ferry, train or bus links to make the logistics of your journey easier. We have a wealth of incredible feedback that we're both proud of and grateful for. The feedback below is from people with real experiences of being our customers. We are aware that there was a period of time where feedback may not have reached us during the end of last year and beginning of this. We always reply to our Feedback forms so please get in touch again if we didn’t respond to you – it means we didn’t receive it. "Choose Leisure offered me a fair return on brokerage, It sold within 9 months over a difficult summer season and paid my money promptly Regards Alan"
"Purchased a used motorhome from Chosen Leisure last week,could not fault the service we were given, Johnafon was most courteous and obliging,gave every ssistance, also Steve gave us an excellent tutorial on the van,an all round excellent dealer,would recommend all our friends to go there thank you for your all your help"
"Purchased a swift motor home and must say it was a pleasure to deal with Martin Mcgrady sales,and Steve who took the time to show us how everything worked would reccomend this company to anybody looking to purchase a motor home"
"We are thrilled with our new Motorhome and would like to thank Jonathan and the team at Choose Leisure for making it a pleasurable experience. Well done guys and girls." "Just like to say a big Thankyou to Paul Dominic and Charlie for the good service we had when we had a problem, rare that you get such good after service, many thanks oh and Richard who delivered it back 5o our home"
"Took my motorhome in for its mot and service, and was given first class service , I was kept up to date with any faults found .if you want a one stop shop for service and repairs at competitive prices then this is the place to choose"
"Purchased a autoquest 155 a month ago,I was pleasantly surprised by the standard of customer service I received from choose leisure.It is wonderful that they do not give you the hard sell, they have the patience to explain to you every little detail on how your purchase works/operates etc together with a excellent after sales back up.I am extremely pleased with my motorhome am currently touring Wales and the west country and are now comfortable in driving a large vehicle and will be in Spain next week.l can see why the Camping and Caravaning club have Choose Leisure as a recommended dealer l as a individual can't praise them enough.Ta"
"A lovely quick visit, a cup of coffee and mince pie with the team at Choose Leisure, there is no I in team they all pull together and giving a brilliant experience to whoever calls in. 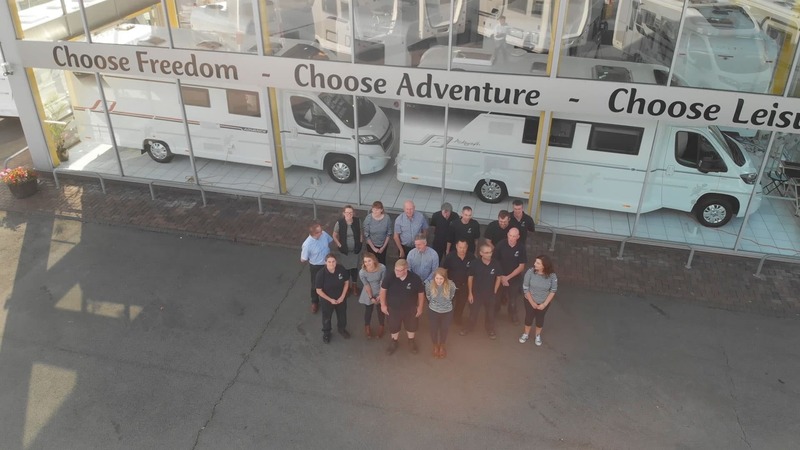 Happy Christmas to you all and thanks for being just about the best"
"All the staff at Choose leisure are very professional and friendly, from the start of us just looking around to part exchanging and purchasing a new motorhome, nothing was too much trouble for Jonathan, the whole process including the handover by Steve was superb."